What is the difference between a cheap lawn care service in Mid-Michigan and a Mid-Michigan lawn care service that is affordable and professional and delivers the best lawn care service in Mid-Michigan? It’s true, lawn care services are a dime a dozen in Lansing, Okemos, Holt, Mason and throughout mid-Michigan. Just search lawn care service near me or look on Facebook and search residential lawn care service in Charlotte, Michigan or search commercial lawn care and maintenance Delta Township or Grand Ledge and you will see dozens of results. Some of these yard service companies have one crew that will come out and mow your yard every week and others have multiple crews that offer complete lawn care maintenance that will do your yards n’ more. With all these choices why wouldn’t you go with the cheapest lawn care service in mid-Michigan that you can find for your home or commercial building maintenance? The cost of lawn care, size of the business or the number of lawn maintenance crews may not determine who the best lawn care service in mid-Michigan is either. We have outlined 10 main reasons why cheap lawn care is not always the best lawn care service in mid-Michigan. Mowing your yard or facility is just one part of lawn care. Rolling, trimming, sweeping, mulching, landscape care, fertilization schedules keep your lawn healthy through all of Michigan’s seasons. Versatility of services for both residential and commercial lawn care maintenance ensures lawn mowers and other lawn equipment are commercial grade and dependable. Consistent fees agreed upon each season helps avoid any billing surprises. Mid-Michigan is anything but predictable. If rains require more visits on some months than other months the schedule is adjusted. There is no excuse for being overbooked! Care is taken from mowing, to attending to landscaping, plus clean up. Care is taken so there is no damage from lawn equipment to vehicles, windows, people and other exterior decorations. Lawn care workers are easily identified with work shirts with logos and business name. An outline for each job details specific tasks at each location. Lawn care professionals are trained to recognizing unhealthy turf or infestations and propose solutions for cures. If a stone flies from a mower and breaks a window who is liable? If a member of the lawn crew, a family member, or customer is injured by lawn care equipment or debris does the lawn care company protect you from responsibility? Eric Rogers is your complete lawn care service provider serving the entire mid-Michigan area. 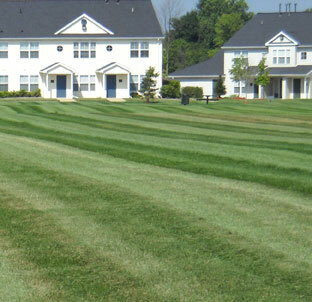 As an affordable and reputable lawn care management company we serve commercial and residential customers. Our customers claim we are the best lawn care in Mid-Michigan and we plan to keep that reputation. If you would like to contract our services for this year please contact us today!